So yesterday was one crazy day, wasn't it? Even from a non-Android standpoint, Hallowe'en means a day of activity for parents of small kids. I feel bad that they kept me from being able to interact with the Android community, but at the same time, Dean had an awesome day and I don't regret that. After all the hypebeasting and rumours and leaks and ... jeez, as someone once said "it got more coverage before announcement than most phones do DURING/AFTER announcements" we pretty much knew everything. Albeit there were some surprises. The device eventually went on sale around 2PM EST while I was videoing my son's class' demonstration of French skills for the parents (you can hear the notification sounds in the video) and was sold out in about 20 minutes. Unfortunately I let that timeline lapse, and so did +Martin Guay. I'm going to wait until later before picking this device up. I'm somewhat bummed that it just came out without an event. Nothing to talk about all the features of not only the phone but of Kit Kat. I'm not sure if that's a testament to the ability of Android, or the fanboyisms of the Android followers. Still, I would have preferred to have an event discussing what is involved in all the features. I'll buy either way, just I feel like we missed out. Sure, last year we didn't get one ... but that was because it was of a hurricane. The event was before the item was sold. That aside, what comes next for our average user? 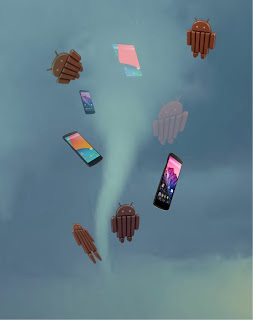 What about Android Kit Kat (4.4)? What about your device? So, let's first dive into Android 4.4, then the phone, then your device. Essentially you know how you have that persistent notification tray and navigation buttons at the bottom? Well on all previous versions they're black backgrounded. Which on my old Galaxy Nexus caused it to burn in some how and now I have a lightish colour on both top and bottom. Well now it's transparent. What's extra cool is they will disappear in some apps (like books) and to bring them back just swipe from that area. In games like Reaper if I get a notification I have to hit the multitask button to be able to see the notification tray... annoying. Well, now I can just do it from the app (or so I'm told). From the new 4.4 launcher you can just say "ok google" to be brought to the voice search. This says only on Nexus 5, but testing the apps out on my 4 it worked on the launcher too. It will be easier to switch back and forth, and better app management of that RAM. Apparently there'll even be a setting to see how the apps are managing their use of memory (just like we have a data and battery meter system now). I'm hoping this works more than just with their own QuickOffice software. I'd love to be able from any app choose to open a Drive file (like I suggested with MusicSheet Pro). 4.4 was also made to utilize less storage/RAM so that devices even as low as 512MB should be able to run it. However, Google's decided that the Nexus S and Galaxy Nexus still will not get this update (I did call back in January, albeit I called it KLP)... apparently needing ot stick to their guns of "18 month support" is more important than proving that Kit Kat has the balls. There's also Hangouts integration with SMS, but I'm saving that discussion for another article. The Factory Images are available from the "hammerhead" (Nexus 5) on the Developers site. If you'd like to start downloading some of the system apps and put them in your own, you can check out Droid-Life for a download apk list (but +Derek Ross led the charge there over at +Android News by Phandroid). Be warned, there's still some issues. Most are working on my Nexus 4 (except I can't get search results from the new Google Now). Now, on to the Nexus 5. This device that was so exciting. First off, it seemed to last longer this time around on the Play Store (my count was about ~20 minutes). Also, there didn't seem to be any problems like there was last time with orders being ghost taken, and then disappearing, etc... so kudos to the team on that front. However, we don't know how many were sold. I really wasn't expecting the LTE. Sure it was probably essential, but I wasn't expecting it. Same with the wireless charging. It wasn't in the G2, so it was neat to see it in the N5 (then again with the accessories from the N4 ... you wanted those to go forward). It was available in Black or White... and there's some nifty looking 'bumper cases' (looks more like a case than just a bumper tho' (I take 'bumper' to mean covering just the sides only). Here's hoping that the next batch of availability will come soon (maybe I'll win the Nexus 7 from the Kit Kat contest and I'll sell that and my N4 for an N5 by then). What about you? What if you didn't get a Nexus 5 like me? What can you do now? Well, you can try those APKs listed above and see about how you like some of the new items. Give you that 'almost 4.4' feeling. 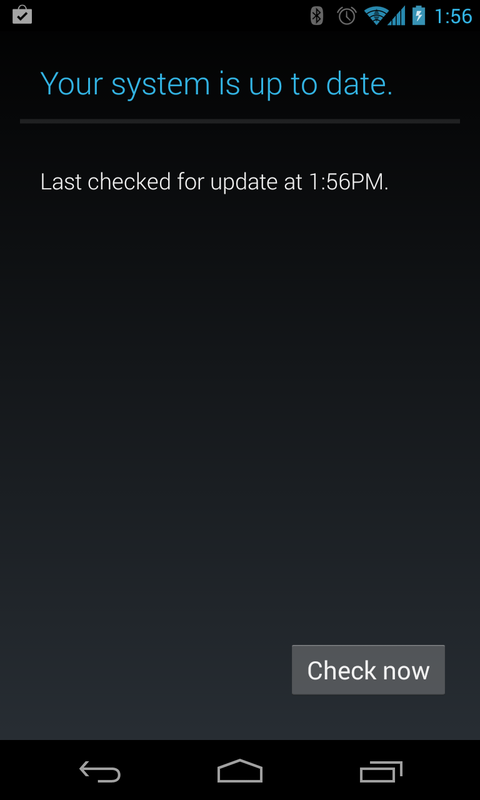 If you're on a Nexus device, you might get 4.4. Google's said the Galaxy Nexus won't get it, but the Nexus 4 should (same as Nexus 7 and 10 - I wonder if they mean the OG N7 or the N7-2013?). It should, but we have not timeline at this point (coming weeks is all we've heard). Last time an update rolled out, I was a week after everybody else (let's hope my vanity URL doesn't take that long). HTC has said that the One series (One, mini, Max) will get it within 90 days. Moto has said that the X will get it (no eta). The Play Edition devices (One and S4) will both be 'soon' (HTC says 15 days). So, time to sit back and be jealous of those that have it, and wait for our update.